This article is about miniature atomic bombs. For portable devices used to authorize the launch of nuclear weapons, see Nuclear briefcase. H-912 transport container for Mk-54 SADM. A suitcase nuclear device (also suitcase bomb, backpack nuke, mini-nuke, and pocket nuke) is a hypothetical tactical nuclear weapon that is portable enough that it could use a suitcase as its delivery method. 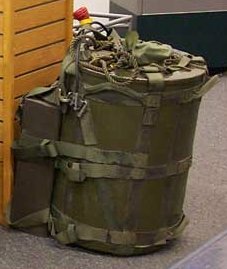 Both the United States and the Soviet Union developed nuclear weapons small enough to be portable in specially-designed backpacks during the 1950s and 1960s. The maximum yield of the W54 warhead used in the Special Atomic Demolition Munition (pictured) was 1 kt (1000 tonnes of TNT equivalent). This is actually larger and heavier than the US W48 nuclear shell at 155 mm (6.1 inches) in diameter and 846 mm (33.3 inches) long and weighing 53.5 kg (118 lb), which represents the smallest complete, self-contained physics package to be fielded and had a yield of 72 tonnes of TNT. Nuclear weapons designer Ted Taylor has alleged that a 105 mm (4.1 inch) diameter shell with a mass of 19 kg is theoretically possible. Conversely, reduction beyond the size of the W54 means that linear implosion designs must be employed and neutron reflectors dispensed with ("bare core"), so a much larger mass of fissile material is required and explosive yield is reduced dramatically. Taylor's figures represent the minimum size and mass to sustain a prompt criticality but the duration without tamper or neutron reflection would be short. The slope of exponential growth, estimated number of fissions, and specific fissile material are not recorded. Neptunium-236 is fissile and possesses the smallest and lightest critical mass, but isolation of the specific radionuclide makes it an impractical choice. Several other novel fissile materials are known, but U-235 and Pu-239 are the only practical options although two US tests using U-233 (critical mass some 32% less than U235) have taken place. Carey Sublette stated that neither the United States nor the Soviet Union have ever made public the existence or development of weapons small enough to fit into a normal-sized suitcase or briefcase. The W48 however, does fit the criteria of small, easily disguised, and portable; but its explosive yield was extremely small for a nuclear weapon. In the mid-1970s, debate shifted from the possibility of developing such a device for the military to concerns over its possible use in terrorism. The concept became a staple of the spy thriller genre in the later Cold War era. The term "suitcase (nuclear/atomic) bomb" was introduced during the 1950s with the prospect of reducing the size of the smallest tactical nuclear weapons even further, albeit purely as a "figure of speech" for miniaturization, not necessarily for the delivery in actual suitcases. The value of portable nuclear weapons lies in their ability to be easily smuggled across borders, transported by means widely available, and placed as close to the target as possible. In nuclear weapon design, there is a trade-off in small weapons designs between weight and compact size. Extremely small (as small as 5 inches (13 cm) diameter and 24.4 inches (62 cm) long) linear implosion type weapons, which might conceivably fit in a large briefcase or typical suitcase, have been tested, but the lightest of those are nearly 100 pounds (45 kg) and had a maximum yield of only 0.19 kiloton (the Swift nuclear device, tested in Operation Redwing's Yuma test on May 27, 1956). The largest yield of a relatively compact linear implosion device was under 2 kilotons for the cancelled (or never deployed but apparently tested) US W82-1 artillery shell design, with yield under 2 kilotons for a 95 pounds (43 kg) artillery shell 6.1 inches (15 cm) in diameter and 34 inches (86 cm) long. Stanislav Lunev, the highest-ranking GRU defector, claimed that such Russian-made devices exist and described them in more detail. The devices, "identified as RA-115s (or RA-115-01s for submersible weapons)" weigh from fifty to sixty pounds. They can last for many years if wired to an electric source. In case there is a loss of power, there is a battery backup. If the battery runs low, the weapon has a transmitter that sends a coded message either by satellite or directly to a GRU post at a Russian embassy or consulate. According to Lunev, the number of "missing" nuclear devices (as found by General Lebed) "is almost identical to the number of strategic targets upon which those bombs would be used." Lunev suggested that suitcase nukes might be already deployed by the GRU operatives on US soil to assassinate US leaders in the event of war. He alleged that arms caches were hidden by the KGB in many countries. They were booby-trapped with "Lightning" explosive devices. One such cache, identified by Vasili Mitrokhin, exploded when Swiss authorities sprayed it with a high pressure water gun in a wooded area near Bern. Several others caches were removed successfully. Lunev said that he had personally looked for hiding places for weapons caches in the Shenandoah Valley area and that "it is surprisingly easy to smuggle nuclear weapons into the US" either across the Mexican border or using a small transport missile that can slip undetected when launched from a Russian airplane. US Congressman Curt Weldon supported claims by Lunev but noted that Lunev had "exaggerated things" according to the FBI. Searches of the areas identified by Lunev have been conducted, "but law-enforcement officials have never found such weapons caches, with or without portable nuclear weapons." Former Russian National Security Adviser Aleksandr Lebed in an interview with CBS newsmagazine Sixty Minutes on 7 September 1997 claimed that the Russian military had lost track of more than a hundred out of a total of 250 "suitcase-sized nuclear bombs". Lebed stated that these devices were made to look like suitcases, and that he had learned of their existence only a few years earlier. Russia's Federal Agency on Atomic Energy on 10 September rejected Lebed's claims as baseless. US Congressman Curt Weldon revived the question in 1999, displaying a "notional model" of what a Russian "suitcase nuke" might look like in a hearing on 26 October, and "lambasting the Clinton administration for not aggressively questioning the Russian government about the existence and location of hidden KGB weapons caches in the United States." The lightest nuclear warhead ever acknowledged to have been manufactured by the U.S. is the W54, which was used in both the Davy Crockett 120 mm recoilless rifle-launched warhead and the backpack-carried version called the Mk-54 SADM (Special Atomic Demolition Munition). The bare warhead package was an 11 in by 16 in (28 cm by 41 cm, small enough to fit in a footlocker-sized container) cylinder that weighed 51 lbs (23 kg). Former Under-Secretary of Defense for Intelligence Michael G. Vickers has claimed that he, along with other Green Berets special forces troops, practiced infiltrating Warsaw Pact countries with backpack-sized nuclear weapons, with a mission to "detonate a portable nuclear bomb." In 1994, the United States Congress passed The National Defense Authorization Act for Fiscal Year 1994, preventing the government from developing nuclear weapons with a yield of less than 5 kilotons, thereby making the official development of these weapons in the US unlawful. This law was, however, repealed in the National Defense Authorization Act for Fiscal Year 2004. Allegations were made in the 1990s that Israel had developed suitcase nuclear bombs during the 1970s. ^ Woolf, Amy F (August 10, 2009), Nonstrategic Nuclear Weapons (PDF), FAS . ^ Shrader, K. "Suitcase nukes closer to fiction than reality". ABC News. Retrieved 2009-08-11. ^ Del Tredici, Robert (1987). At Work in the Fields of the Bomb. New York: Perennial Library. ISBN 9780060550592. ^ Sublette, Carey (2002). "Are Suitcase Bombs Possible?". Nuclear Weapon Archive. ^ "Complete List of All U.S. Nuclear Weapons". Nuclear Weapon Archive. ^ Gsponer, Andre (15 October 2018). "The B61-based 'Robust Nuclear Earth Penetrator': Clever retrofit or headway towards fourth-generation nuclear weapons?" (PDF). Independent Scientific Research Institute. ^ "Preventing Suitcase Warfare: Loren Eiseley, the great University of Pennsylvania author and anthropologist, recently predicted a future of 'suitcase warfare,' in which terrorists would utilize miniaturized atomic weapons." Forbes 115 (1975), p. 115. ^ Used e.g. in The Fourth Protocol by Frederick Forsyth (1984). After the end of the Cold War frequently invoked as a trope of the period, e.g. in the Tom Clancy's Splinter Cell video game (2002) North [from] Calcutta (2009) by Duane Evans concerns the planned use of a suitcase bomb in the India-Pakistan conflict, cited as a realistic depiction of this type of threat by H. B. Peake, "The Intelligence Officer's Bookshelf", Studies in Intelligence, Journal of the American Intelligence Professional, Unclassified Extracts from Studies in Intelligence 53.3, Central Intelligence Agency, Government Printing Office (September 2009), p. 44. ^ a b c d e Stanislav Lunev. Through the Eyes of the Enemy: The Autobiography of Stanislav Lunev. Regnery Publishing, Inc., 1998. ISBN 0-89526-390-4. ^ Nicholas Horrock, "FBI focusing on portable nuke threat", UPI (20 December 2001). ^ Steve Goldstein and Chris Mondics, "Some Weldon-backed allegations unconfirmed; Among them: A plot to crash planes into a reactor, and missing suitcase-size Soviet atomic weapons." Philadelphia Inquirer (15 March 2006) A7. ^ "'We don't know what General Lebed is talking about. No such weapons exist,' a ministry spokesman told AFP. 'Perhaps he meant old Soviet nuclear artillery shells, which are all being safely guarded.' Carey Sublette, Alexander Lebed and Suitcase Nukes (2002). ^ Congressman Weldon Fears Soviets Hid A-Bombs Across U.S. NTI, 26 October 1999. Peter Richmond, How to Build a Briefcase Nuke, GQ, February 2002. ^ "A Secret Warrior Leaves the Pentagon as Quietly as He Entered". ^ "National Defense Authorization Act for Fiscal Year 2004: Repeal of the 1994 act". ^ "National Defense Authorization Act for Fiscal Year 2004: Sec. 3116. Repeal of prohibition on research and development of low-yield nuclear weapons" (PDF). United States Government Publishing Office (GPO). November 24, 2003. p. 356. Retrieved October 25, 2018. ^ Hersh, Seymour M (1991), The Samson Option, New York: Random House, p. 220, ISBN 0-394-57006-5 . Wikimedia Commons has media related to Tactical nuclear weapons. Symposium: Al Qaeda's Nukes by Jamie Glazov, FrontPage Magazine, October 27, 2006. Article discussing the development of smaller nuclear weapons in the U.S.A.